I am so glad that I challenged myself to read 100 books this year. I don’t know if I will still be glad in a few months, but right now it is just what I needed. One of the reasons that I set my goal at 100 books is because I knew I needed to get my social media use under control. I am not quitting social media all together, but I need to cut back. I am spending way too much time on it. My hope is that I will grab a book instead of scrolling mindlessly through social media. So far it has helped and I have realized that I waste too much time mindless scrolling on my phone. I have also realized that I spend way more time watching t.v. than I realized. I don’t watch a lot of t.v. No one in the family really does. We really limit our t.v. watching to some news, HGTV, Foodnetwork, movie night, and some occasionally sports. There are no shows that are current must sees for me. I am not anti t.v. I just usually limit my time watching it. If you had asked me a month ago I would have said I rarely watch t.v., but apparently I watched more than I realized, especially right before bed. Now I make myself grab a book first. I tell myself that I am going to read a chapter or two before turning on the t.v. Often times I get so involved in the book that the t.v never comes on. So my t.v watching has definitely gone down, which I think is a good thing. So far this year I have read 9 books. I am really happy with that number and a little surprised. I thought I would have a hard time reading 2 books a week, but if I keep this up I will definitely reach my goal of 100. This post includes affiliate links that help pay for this site and what I do. Thank you! Shoe Dog by Phil Knight– I loved this book! It is going on my list of all time favorite business story type books. I found this book interesting for many reasons. One of which is that NIKE is an Oregon company and I grew up in Oregon. I have driven by NIKE headquarters many times. I drive by it every time I visit family in Oregon. But I learned a lot about NIKE that I had no clue about. NIKE didn’t start as NIKE. It had a totally different name. The book was also a reminder that success doesn’t happen overnight. It almost always takes years of work, training, failures, and a great team to help you. There is so much I could say about this book, but I will just say if you love stories about business and what makes them what they are this is a great book. Grace read it recently and reviewed it and she agrees. She loved it as well. Anne of Avonlea by L. M. Montgomery- This is book 2 in the Anne of Green Gables series. I read this as part of my goal to reread the Anne of Green Gables series this year. I am really enjoying rereading these. Anne of the Island by L.M. Montgomery- This is book 3 in the Anne of Green Gables series and I loved this one. The first time I read this series I remember book 1 and 3 being my favorite of the whole series. I think this will still be the case. Book 2 was good, but I enjoyed books 1 and 3 even more. A Stranger In Mayfair– This is the fourth book in the Charles Lenox Mystery series. I discovered this series last year and loved it. I read the first three books quickly and can’t wait to read this one. I am glad I found this series, because it is a series my teenage son is enjoying as well. The Residence: Inside the Private World of the White House– This book was on my list of books that I hope to read in 2017. I just started it, but so far am enjoying it. A Night to Remember by Walter Lord– I have been reading this one for months and am reading it very slowly. I realized something about this book this week. The few times I picked it up to read was right before I went to bed, which is not a good time to read it. I am enjoying this book, but I don’t really want to read about the Titanic sinking right before I fall asleep. I am going to have to try to grab this one during the day when I am more in the mood for it! Lost Women of the Bible– I am still working on this one. This was on my list of books to read in 2017. This book was given to me by a friend that really enjoyed it. This book is not going to be a fast read for me. I fully expect it to take weeks to get through. It is good, but it is a Christian study type book so I end up thinking through it a lot as I read it, which makes it a slow read. I didn’t get as much read this week as I had hoped to, but I still did pretty well. I finished two books and got about halfway through two others. So overall it was not a bad reading week. Two books a week is what I need to reach my reading goal for the year. I am happy that I finished two books this week and that I got a good start on a few others. The Magnolia Story by Chip and Joanna Gaines– I loved this book! I bought it for my oldest daughter for Christmas and then we kind of all fought over who got to read it first. Since it was her book, she won that debate. Grace read it next and loved it. I finished it this week and I agree with both of them it is a great book. It was an easy read, but a good growing business memoir type book. If you like their show at all I think you will enjoy learning more about their story. You can read my full review of it here. Belgravia by Julian Fellowes– This was my fun read on my Kindle. I read it while I was waiting at doctor’s appointments, which we have had a lot of lately. I like books like this when I don’t have a lot of time to focus on a serious read. I got this book when the Kindle version was on sale really cheap a few months ago and finished it this week. This is written by the Julian Fellowes, best known for Downton Abbey. If you are a Downton Abbey fan I think you will like it. It was good, but I didn’t love it. I enjoyed the first half of the book better than the second half. The first half was spent building up the story, but the second half seemed a bit predictable to me. I kind of saw where it was going and how it would end. Overall though it was an easy read, and a good book for fans of Downton Abbey. 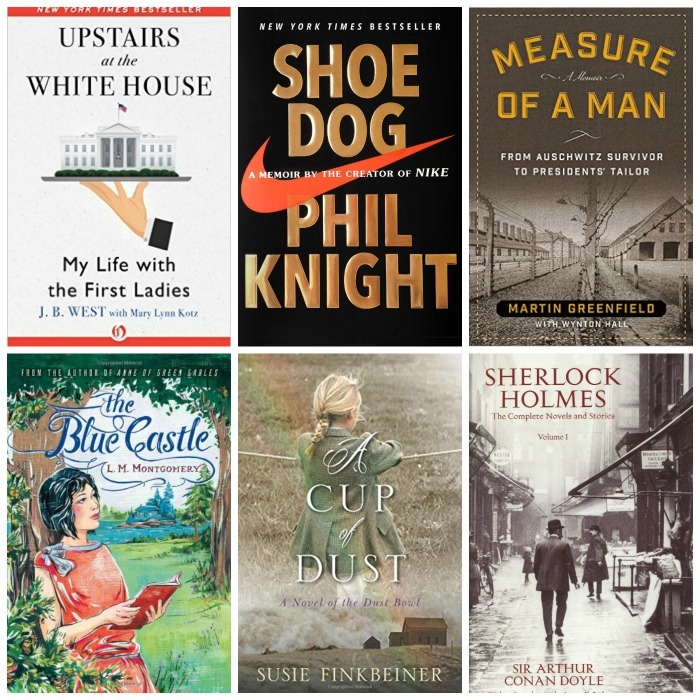 Shoe Dog by Phil Knight– I am still reading this one and am really enjoying it. I was hoping to finish it this week, but didn’t get it done. A Night to Remember by Walter Lord– I have been reading this one for months and am reading it very slowly. I have to be in the mood for and I find myself just reading a little bit every week or so. I made a little progress on this one this week. The more I get into this one that more I enjoy it. 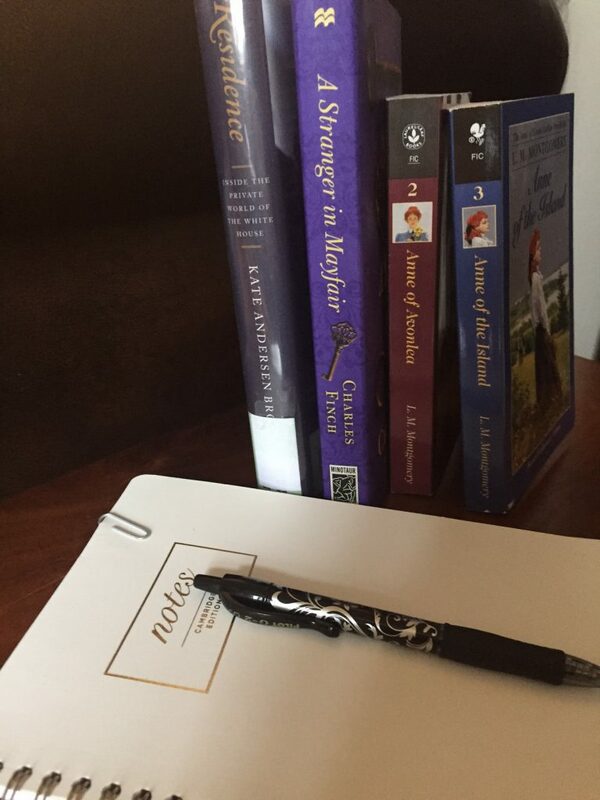 Anne of Avonlea– One of my goals for the year is to reread the Anne of Green Gables series. I read book 1 and this is book 2. I am really enjoying rereading these. I have forgotten a lot about the books and can’t wait to finish the series again. Lost Women of the Bible– This was on my list of books to read in 2017. This book was given to me by a friend that really enjoyed it. I started it this week and so far I really like it. I read 100 books in 2016. I read seven in the last week, so I could make it to 100 books. 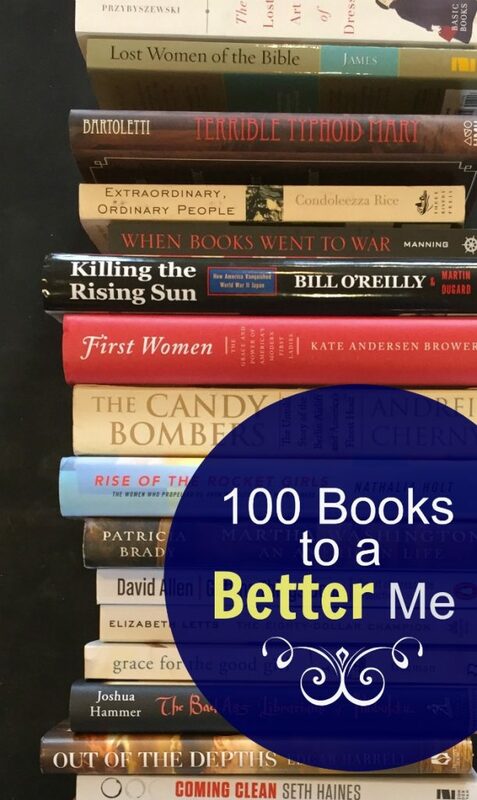 I know a lot of people think 100 books is a lot, but it isn’t for me. In 2015 I read 150 books. I am quite glad that I was able to hit 100 books in 2016, but my goal for 2017 is to read more books than my mom and her goal is 100 books. So, I will have quite a bit of reading to do in 2017! I believe that reading is a great activity that helps expand the mind, which is why I enjoy reading a variety of books. I do enjoy my fun reads, yet I find history books fascinating too. I thought I would share a few of my favorites from 2016. This post contains affiliate links. Purchases made through these links help support this site. Thank you! I am so excited for this new series where I share what I am reading every Sunday. It is just what I need to help keep me motivated to reach my reading goal for the year. Each week I plan to share the books I finished, the books I am currently reading, and what I think of them. One of the things you will quickly realize about me is that I almost always have at least three books going at the same time. Some of the time, like this week, it is more like six or more… I know that this drives many people crazy, but it works for me. My kids can’t believe I read this many books at a time. They usually have two books going. One serious and one fun book. I like to have quite a few books going at once though. I usually have a non-fiction history or biography, a fun fiction book, a Christian book, and usually a business or time management type book. Plus, I like to have a fiction and a non-fiction on my Kindle that I read when I am not at home. It all adds up to a lot of books going at once. Yes, it is a bit crazy, but it really does work for me. It allows me to read something no matter what mood I am in or how much time I have. This week I finished four books. I know that sounds like a lot, but several of these are books I have been reading for awhile. I was trying to finish them up before the end of the year and it didn’t happen. I was determined to get them done this week and I am glad that I did. How to Manage Your Home Without Losing Your Mind by Dana White– I started this book last fall when I was sent a free copy to review. I know Dana and love her blog. Her book was a great read. The book took me awhile to get though, mainly because of the holidays and me not wanting to think about organizing at the time, but it is a great read. You can read my full review of it here. Wildwood by Colin Meloy– I have heard about this book for awhile and finally decided to read it. It is considered a children’s books, but I decided to read it anyway since it sounded like a fun book. One of the main reasons I wanted to read this book is that it takes place in Portland. I grew up in Oregon, west of Portland, and know the area well. I loved that about the book. The rest of the book I had mixed feelings on. You can read my review of it here. Running the Race Eric Liddell by John W. Keddie– I love biographies, especially Christian biographies. Many of the Christian biographies I read as a teen impacted me in ways that have lasted years. They also gave me a love of biographies that I think will last a lifetime. They are my favorite books to read. I started this book months ago. It has taken me awhile to get through. This book was good and well worth reading, but I am not a sports fan. This usually isn’t a problem when reading books like this, but the first half of the book was heavy on sports facts and stats. Some people love that, but for me I could only take so much of that at one time. Thus the reason why it took me so long to get through. You can find my full thoughts on the book here. Anne of Green Gables by L.M. Montgomery– I am not a huge rereader. In fact, I can only count a few books that I have read more than once, but one of my goals for the year is to reread the Anne of Green Gables series. I am going to do a whole post on this soon, but the main reason is that it has been years since I read them and I have forgotten a good portion of these books. I don’t want to forget Anne, so I thought they would be fun to read for this year. And the first book was just that. It was a fun and easy read for the week. I can’t wait to read the next one. The Magnolia Story by Chip and Joanna Gaines– My girls and I all wanted this for Christmas, so I got it for my oldest daughter and then we kind of fought over who got to read it first. 🙂 She read it first, since it was her book. Then my other daughter read it and now it is my turn. I am not very far into it, but so far I am enjoying it. Shoe Dog by Phil Knight– My daughter Grace got this for Christmas and loved it. Yes, she already finished it and gave it to me to read. I had not planned on starting it yet, but she finished it while we were waiting at a doctor’s appointment and then handed it to me. I didn’t need another book to read, but since I was holding it and had nothing else to do, I opened it up and started reading it. So far I like it. 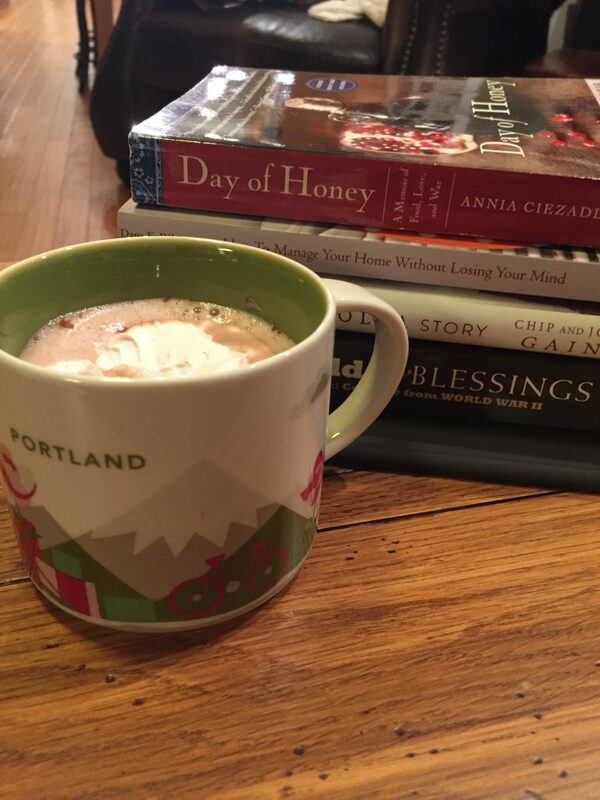 Day of Honey by Annia Ciezadlo– This is a food memoir I started back in November. I am enjoying it, but it is a bit of a slow read for me. I am about halfway through it. The main reason it is slow is that it is a tough subject in our modern world and I have to be in the right mood to read it. The writing style is also ok, but not my favorite. I only pick it up occasionally to read, so it might take me a little longer to get through it. A Night to Remember by Walter Lord– This is another one that I have been reading for months and am reading very slowly. It is another one that I have to be in the mood for and I find myself just reading a little bit every week or so. Belgravia by Julian Fellowes– This is my fun read on my Kindle. I read it when I am waiting at doctor’s appointments or for my kids and don’t have a lot of time for a serious read. I like quick and easy reads for times like that. I got this book when the Kindle version was on sale really cheap a few months ago. I am over halfway through it and have mixed feelings. I will share more of my thoughts after I finish it. Has anyone read this one? I would love to hear your thoughts if you have. Battlefields and Blessings by Larkin Spivey– This is actually a daily devotional type of book, but I am not reading it like that. It is set up so that every day is a different short story about a person or event from WWII that showed faith and courage in Christ. I plan to just pick this one up and read a few pages once in awhile. It is an easy book to start and stop since every page is about a different person or event. I am only a little bit into it, but so far it is good. I would love to hear what you are reading this week? Have you found any good books that I need to know about? This year I set a huge reading goal or at least what seems like a huge reading goal to me. I have always been a big reader, but it wasn’t until 2014 that I started keeping track of exactly what I was reading each year. I wish I had started keeping track long ago, but I am glad that I started writing it down in 2014. Since I did not keep track before 2014, I am not sure what my biggest reading year was. I am guessing I have averaged 50 books a year for quite some time though. In 2014 I read 40 books. In 2015 I read 53 books. In 2016 I read 66 books. My goal for 2017 is 100 books! That is basically two books per week, which is quite a bit more than I read last year. But I really wanted this to be a crazy goal. 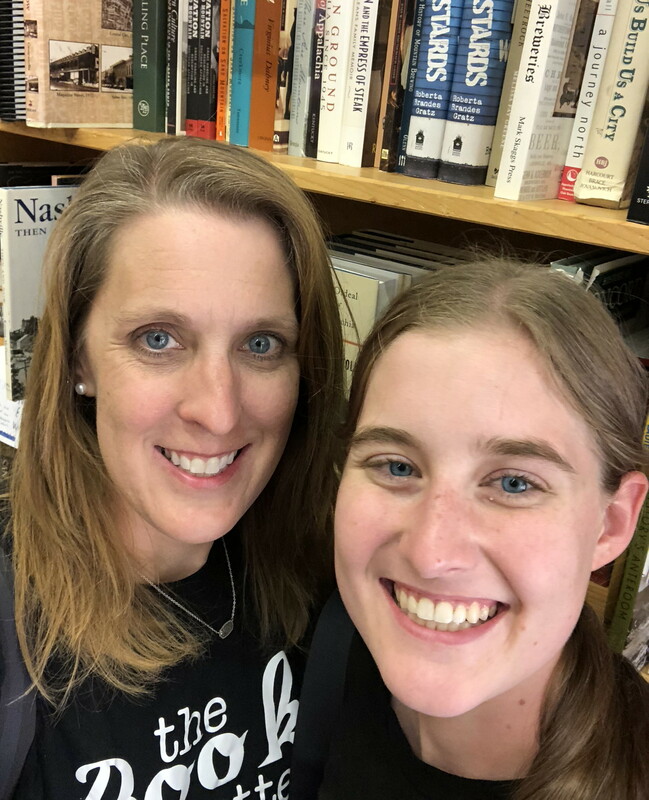 When I told my daughter that I was going to try to read 100 books this year, she thought I was crazy. She easily reads that each year, but she doesn’t think I can. When I was talking it over with my husband though, he said it was a great goal because there is a reason behind this goal. I spend way to much time on social media. Anyone else with me on that one…so much time. I have to do some social media for this site and for Lynn’s Kitchen Adventures. I enjoy doing it because it is a great way to interact with readers. I am not going to give it up. But the reality is, I spend too much time doing other things. Wasting time. Scrolling through mindlessly looking at stuff. Clicking on news articles that are just trying to get your attention, but don’t tell you anything new. Scrolling through seeing the drama some people post. Watching Instagram stories that are kind of pointless. You get the idea. And it is a real struggle in the social media driven world that we live in. Social media noise is everywhere. I need to tone that noise down. Not take it down totally, but quiet it down and get it under control. So instead of grabbing my phone I want to grab a book or my Kindle and I want to read. I want to stop mindlessly scrolling through social media and instead try to use my time more wisely. I also want to read high quality books. I read a lot of non-fiction already and I want to keep that up. Want to join me? I would love to have some readers set this as a goal. Not the 100 books goal necessarily, but the goal to grab a book instead of mindlessly wasting time on social media goal. I thought about starting a Facebook group, and I might still do that, but that kind of seems to go against my plan of getting social media under control. So I need to think carefully on that one before I do it. I’d love to hear your thoughts on that. 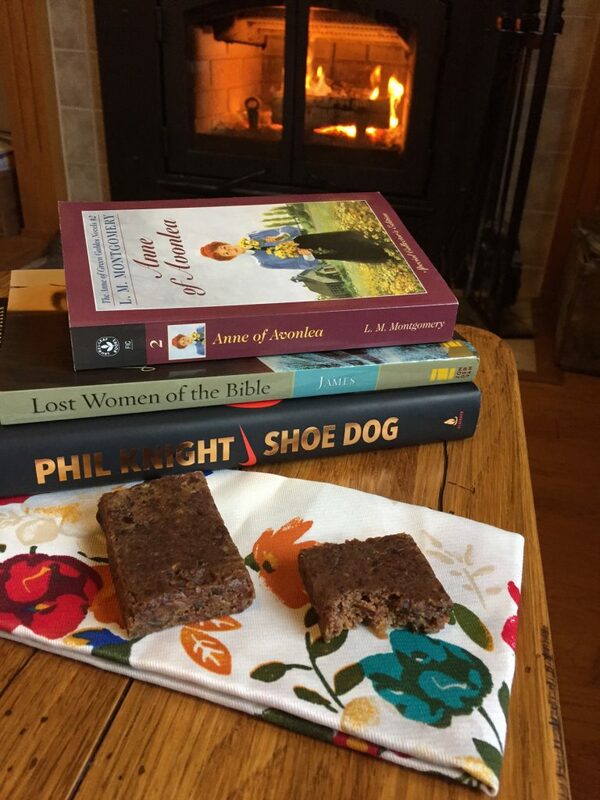 Are you interested in a Facebook group where we talk books, what we are reading, and what we are doing to read more and scroll through social media less? If I do something like that I want it to be helpful and not add to the noise. Leave me a comment. I would love to hear your thoughts. My plan is to share every Sunday evening what I read. I will share the books I started reading, the books I finished, and what I think of them. Sharing every week will help keep me accountable and it will give you a look into what I am reading. Hopefully it will help you add some books to your reading list as well. Be sure to check out the list of 23 of the books I hope to read this year. Now I better go do some reading!